During our meat-free meal week, we happened to catch an episode of Good Eats where the theme was ‘pouch cookery’. This inspired us to create our own version of a ‘pouch meal’, similar to one made on the show. By sprinkling some anise-flavored liquor such as Ricard, Duval or Pernod, the result is a sweet ‘sauce’ that mixes perfectly with the salmon meat. I really hope you try this quick, easy, cheap and nutritious meal. Plus, it’s the easiest cleanup ever! 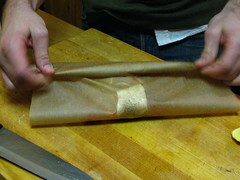 Lay your salmon skin side down on the parchment paper. Scatter your veggies around it. 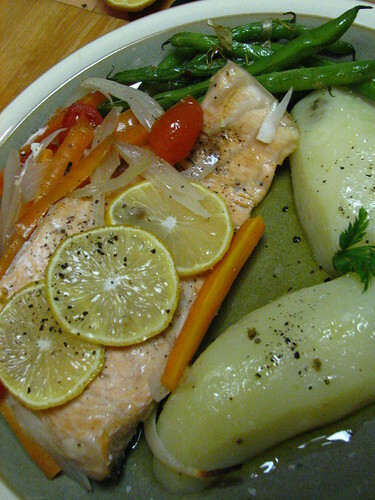 Sprinkle some rock salt and freshly ground pepper all over your fish and veggies. 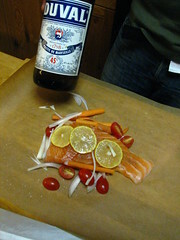 Squeeze a bit of lemon on top and drizzle about 1 – 2 tablespoons of your anise-flavored liquor over the salmon and veggies. Drizzle a little bit of olive oil on top of everything. 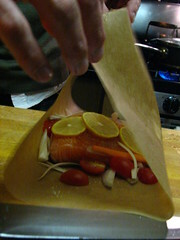 Make your pouch by taking the two ends together and fold over a few times until there’s about 1 inch of room on top of the salmon. 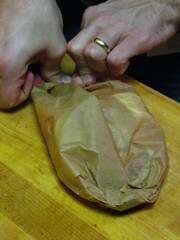 Pinch the other ends in and then fold towards the center seam to create a closed, tight “pouch”. (SEE PICTURE BELOW). Put in a 375 degree oven for 15 minutes. 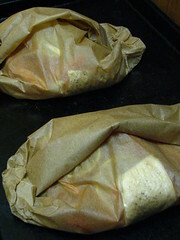 Remove, open pouch and voila – dinner’s ready! Eat along side some boiled potatoes (boiled long enough that they still have a bit of ‘give’ in them) topped with some rocksalt olive oil and chives. Oh my gosh that looks so divine! I think I might try it. I need to have a non meat week too! This sounds like such a simple and delicious recipe. We must try it someday! Thanks for stopping by, how fab that you too are a new yorker married to a Brit. 🙂 We lived in Bklyn for a short while. My sis lives in Park Slope. Surrounded by wonderful restaurants! Am utterly jealous. Meat sweats! I thought I was the only one. When I try to explain it to anybody, they usually look at me really, really weirdly. I got to your blog by way of cook, eat, FRET and I’m enjoying your blog very much. I’ve had pages upon pages called up, ready to be read, but you know how it is, work always interferes.